Over the course of the next month until the NBA Draft on June 24, RTC will be rolling out comprehensive profiles of the 30-35 collegians we feel have the best chance that night to hear their names called by David Stern in the first round. There won’t be any particular order to the list, but you can scroll back through all the finished profiles by clicking here. Overview: Ekpe Udoh began his college career at the University of Michigan, but transferred to Baylor after one season under John Beilein in search of a better fit. With the Wolverines, he was little more than a tall, skinny shotblocker, but when he re-emerged last season in Waco, he was a far more complete player with a range of skills that had been previously unseen. Udoh’s presence turned the Bears into a legitimate contender on the national scene, providing balance to a team that had previously been over-reliant on perimeter players, and resulting in a first-ever Baylor run to the Elite Eight. Udoh averaged 13.9 PPG and 9.8 RPG while blocking a sizzling 3.7 shots per game on the way to taking second-team All-Big 12 honors, a Big 12 All-Defense team spot and receiving honorable mention on the AP All-American team. Udoh is 23, and that is something of a knock against him, but given his size, his 7’5 wingspan and his versatile skill set, he has the potential to be a very productive pro. Will Translate to the NBA: Udoh’s biggest strength throughout his career has been his shotblocking ability, and that will surely carry over to the NBA. He can not only block the shots of the man he is defending, but he can come from the weak side and help teammates. He is also a very good rebounder (11.1 total rebounds and 4.1 offensive rebounds per 40 minutes last season), but it is his improved offensive skills that make him such a valuable commodity. He can score in the post with both hands, knock down jumpers out to 18-20 feet, face up and put the ball on the floor, and beat bigger defenders off the dribble. He also showed improved court awareness, handing out 3 assists per 40 minutes last season, and displayed a strong basketball IQ. Needs Work: Despite Udoh’s improvement, he was still somewhat inconsistent as a junior. While he was certainly capable of putting up lines like the 18 pts, 10 rebs, 6 asts, and 5 blks he had in Baylor’s season ending loss to Duke, he also could put up just 8 pts and 4 rebs like he did against Old Dominion in the second round. Perhaps the first step for Udoh to become more consistent could be hitting the weight room. While he was never in bad shape in his college career, and he came back much stronger after his transfer season, he will need to bulk up in order to compete against NBA fours every night. And finally, while he was a very effective interior defender in college, he may face a different breed of power forward at the next level, so he’ll need to prove his ability to stay with guys with an offensive game outside of the paint. Comparison Players: On the upside, we’ve seen Udoh compared to Andrei Kirilenko or even Chris Bosh, and those seem to be reasonable comparisons, but then we see the downside comparisons to Hilton Armstrong and (ugh) Jerome Moiso. Udoh certainly has a better motor and a better set of skills than Moiso or Armstrong ever did, so throw those comparisons right out and let’s focus on the Kirilenko comparison. Udoh has a better frame than AK-47, and could grow into a stronger interior player, but perhaps has a touch less athleticism and leaping ability. Both players, however, have versatile if understated offensive games and both are long athletic defenders. But, one of Kirilenko’s weaknesses throughout his career has been his inconsistency and tendency towards injury, a problem that Udoh could share if he doesn’t improve his strength. Best Case Scenario: Udoh bulks up, his offensive improvement continues, and as he gets comfortable with his game his inconsistency vanishes and he turns into a starting NBA power forward with the capability of getting some spot minutes at the three. He consistently gets votes for the All-defensive team and, in his career years, squeezes out an All-Star appearance or two. 2013 Projection: Udoh should be a starting four-man, based on little more than his defensive and rebounding abilities. We can’t see him ever being a go-to guy offensively, but he has enough on that side of the ball to not be a liability, while being an outright strength defensively. There’s no reason Udoh couldn’t average around ten rebounds and three blocks by his third season. Best NBA Fit: With Chris Bosh potentially headed for greener pastures this offseason, the Toronto Raptors would seem to be a perfect landing spot for Udoh, a place where he could get minutes right away and perhaps earn a starting spot by his second year. With Andrea Bargnani locked up for the long haul at center, Udoh would provide a more physical counterbalance to Bargnani’s finesse game. Unfortunately for Udoh, he’d have to fall all the way to #13, past teams like the Clippers, Jazz, Pacers and Hornets, all teams that could have interest in him as well. This entry was posted on Thursday, May 27th, 2010 at 4:30 pm by rtmsf	and is filed under 2010 profiles, nba draft. 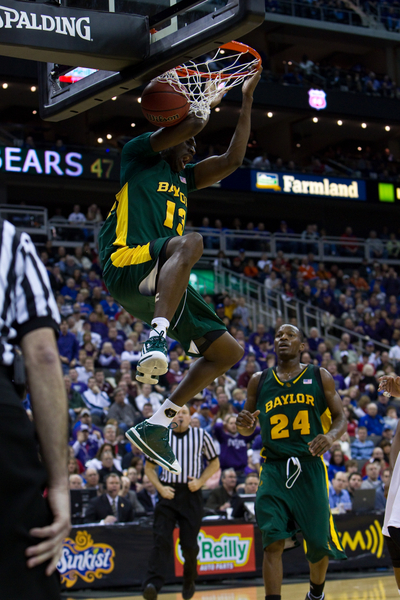 Tagged: baylor, ekpe udoh. You can follow any responses to this entry through the RSS 2.0 feed. You can leave a response, or trackback from your own site.